It's true, I prefer to walk on the wild side. Notice anemic dry pork chops and turkey burgers didn't make my list. I've got some old leather shoes in the closet that I'd prefer to eat any day. So when I see a pile of furry little squirrel bodies sitting on my counter, I don't feel an ounce of repulsion. Instead, my heart speeds as I anticipate the meal that awaits me - a meal resplendent with meat which is dark and succulent and flavorful. If you're lucky enough to get your hands on some, prepare yourself for the bliss of tugging tender bits of meat off the tiny bones with your teeth, little morsels of perfection. If you're unsure of the age of the animals you've got (as with a lot of meat - older squirrel can be tougher), then try making this Squirrel Fricassee with Elderberry, Juniper, and Wild Onion Gravy. The slow cook over moist heat makes for tender meat every time. 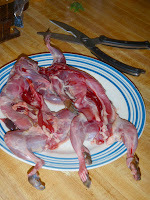 After the squirrels (two fit in a 10" skillet comfortably) have been skinned and gutted, snip off their feet to avoid the scent glands, and give them a thorough washing, being careful to remove all stray bits of fur, which can leave an unpleasant taste. Then, using a knife or pair of kitchen shears, break down the animal into parts, almost like you would a chicken - forelegs, hind legs, and cut the back into two pieces. Place the squirrel pieces into a bowl and cover with yogurt or buttermilk, and let sit in the fridge for at least an hour. Prepare a bowl of seasoned flour for dredging. I like to use sorghum flour seasoned with onion powder, cayenne, and salt. Remove the squirrel pieces from the yogurt marinade, stripping off excess yogurt with your fingers, then dredge them in the seasoned flour. Fry in lard in a skillet over medium heat until the crust is golden. Remove the squirrel from the pan, and fry 1/2 c. diced wild onion in the grease until tender, then add 1 Tbsp. wild juniper berries (half that amount if using store-bought), and 1 c. elderberries. Return the squirrel to the pan with the other ingredients, cover with 1 c. of water, cover, and let simmer over low heat for an hour. Add water as necessary, to keep the gravy from drying out. After an hour, the squirrel meat will be cooked to perfection. Simply strain the gorgeous pink gravy through a sieve, adjust seasoning, and serve with a heaping pile of mashed root veg. This post is my entry into this week's Hearth 'n Soul blog hop. It's the best resource for real food recipes that feed the soul, so go check out all of the fun links. I actually dont' think I've ever had any of your favorite meats! I obviously need to broaden my game horizon. You definitely did a good job selling squirrel to me! Ms Butterpoweredbike, My Dad was an eater like you! 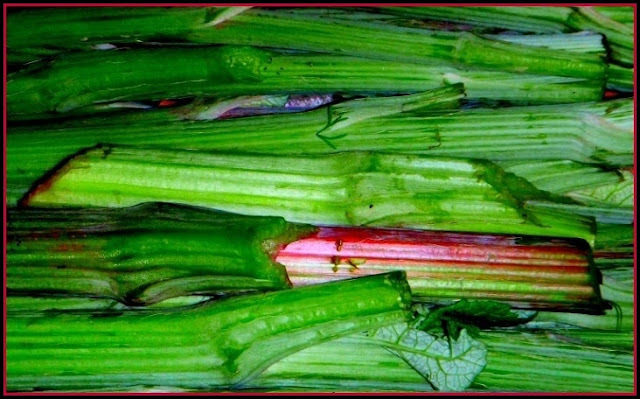 We would forage for all sorts of different foods when we went walking or hiking. But I do declare, you beat me in the brave eater arena. You give great directions for dressing out a squirrel, but I still think the closest I will get to one, is when I hand off a peanut at the back door. If, by chance, I ever come out and visit, which you know I will some day, you are gonna make me some squirrel! And I totally need some elderberries!!! PLEASE!!! We dont have them around here! You are the coolest person I know. Period. please, please, please link this up w/ GYO this month...it's so insanely amazing! 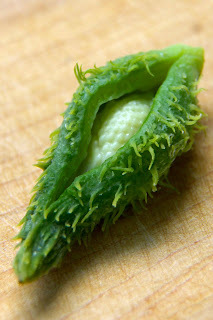 What a great post - we don't have squirrels in New Zealand, but we do have possum which I imagine might taste quite similar - I ate it once at a great restaurant we used to have in Auckland back in the '80s that specialised in game - sadly long gone now. I enjoy eating game but I have never tried squirrel. It most certainly looks interesting. I am wondering if I can get hold of squirrel in my neck of the woods. Another nice recipe I have found via the hearth 'n soul blog-hop. I'm going to sound like a bit of a wimp here, but unfortunately I am just not very brave when it comes to game! 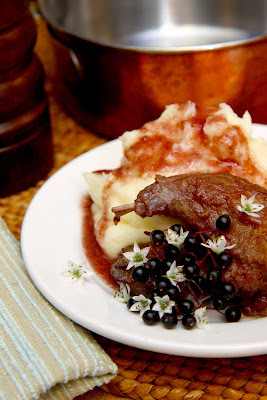 I found your post really interesting though, and the idea of adding juniper and elderberry to wild onion gravy sounds like something that would be lovely with some of the meats I do eat. Thanks so much for co-hosting the blog hop! Butter, you are adventurous when it comes to meat. I have never had squirrel, though my husband has. We do eat plenty of venison since my husband goes deer hunting every fall. I wonder how many squirrels it would take to feed my family???? I would love to try this. I know my husband has eaten it - I will have to ask him about it. And I agree with heather - you are THE.COOLEST.PERSON.EVER!!! Do you skin and gut them yourself or do you get MacGuyver to do it? That sounds like man's work, to me. I have never eaten squirrel. One ran down my driveway in front of my car today, but I wasn't fast enough. We do have many elderberries here, and I make jelly with them. I bet they would taste lovely with the gamey meats. Honestly, there's nothing brave or adventurous about eating squirrel. I eat what tastes good, period. Christy - with a few side dishes, I'd figure one squirrel for every two people. Bonnie - Thanks! You gave me a good laugh. Butter we were raised on almost exactly the same meats. My boys and I just got some squirrels over the weekend. I've never tried them in a recipe like that but it sounds delicious!! Jason- It makes me so happy to hear that you feed your family that way :) It just doesn't get any better, does it? wow, when I saw squirrel mentioned in title, I couldn't believe my eyes. I didn't know they are eatable. I thought just like cats - they are not. Dalia - It's true, they're edible, and darned tasty, too. 1. Toronto is so diverse that there hasn't been any "new" offerings in quite some time. 2. We have squirrel problems. That's one of my stumbling blocks with game animals. Hi Dan - I don't know about eating your squirrel, I like to know what my food has been eating, and TO is an awfully big city. That said, if there weren't a pesky ordinance about discharging a firearm within city limits, I'd consider luring squirrels to my back porch to pick off. After all, they routinely eat the best of my fruit and chewed up my swing. I haven't found the bones of either squirrel or rabbit to be much of a problem. I can't remember ever having one shatter on me.